Create a moving file for quotes, receipts and records for your move. As soon as you know your moving day, begin the process of reserving a moving company, crew or vehicle for your move. IMPORTANT Ultimate Moving Checklist To-Do: Determine your moving budget. Moving takes a lot of energy, elbow grease and money so make sure you’ve set aside enough money to cover all the costs. For reference, according to the American Moving and Storage Association, the average cost of an interstate household move is $4,300 (distance of 1,225 miles). The average cost of an intrastate move is $2,300 (4 movers at $200 per hour). Both of these average moving costs are for 7,400 pounds. Request time off from work for moving day. Many new homeowners also prefer to take additional days off after the move to get settled in and take a breather before normal life kicks back into gear. Choose schools for your kids and request to transfer your kid’s school transcripts from their current schools to the new schools. Plan a garage sale. Host it over one weekend, 2-4 weeks before your moving day. Confirm your moving company is licensed and insured by checking the status of their Department of Transportation number (DOT number). Begin to collect free boxes from local restaurants, grocery, liquor, office supply stores and bookstores. Of, if it’s in your budget, purchase your packing supplies including boxes. Begin fixing minor home or apartment repairs – May mean the difference in getting your deposit back and that money can be helpful after moving. Label moving boxes for each room – Remember to mark “fragile” boxes. When disassembling furniture, place all hardware in labeled baggies. Get change of address cards from local post office or do it online. Start to clean out your closets, the garage and attic. Gather infrequently used/worn socks, t-shirts, towels and linens to wrap dishes and other fragile houseware items for packing. Notify any subscription services, newspapers, magazines; and financial partners such as banks, lenders, credit cards, insurance companies, and all employers about your move and fill out any necessary paperwork they require to update their records. If you’re moving long distance, get your car(s) serviced. If you’re using a moving company, be sure to purchase moving insurance. Confirm whether your moving truck will need a permit to park on moving day. IMPORTANT Ultimate Moving Checklist To-Do: Compile all financial and legal records; medical records; birth certificates, social security cards and passports and designate a safe and secure storage space for the move. Return all library books, movies and video game rentals. Get your clothes dry-cleaned one last time before the move (if needed). Otherwise, wait until after the move so they do not get all wrinkled during the move. If you’re moving out of town, find a new doctor and dentist (who are in your insurance network) so you are prepared if anything happens during the move. If you have pets, and your leaving town, find a new vet so you’re prepared in case something happens during the move. Also, request copies of all vet records and get necessary pet medication records from your current vet. Shop around for new cable, internet and phone providers. Shop around for garbage and recycling services. Dedicate one closet for the final clean up. Stock this closet with what you will need for moving day, including all of your cleaning supplies, garbage bags and snacks. Recycle or dispose of any harsh chemicals or flammables according to local laws. Plan 2 weeks of meals to minimize the amount of groceries left in your refrigerator on moving day, and really try to use all of your freezer items. Return items you borrowed from friends, family or neighbors. Backup your computer. You do not want to lose anything; especially if your computer is damaged during the move. 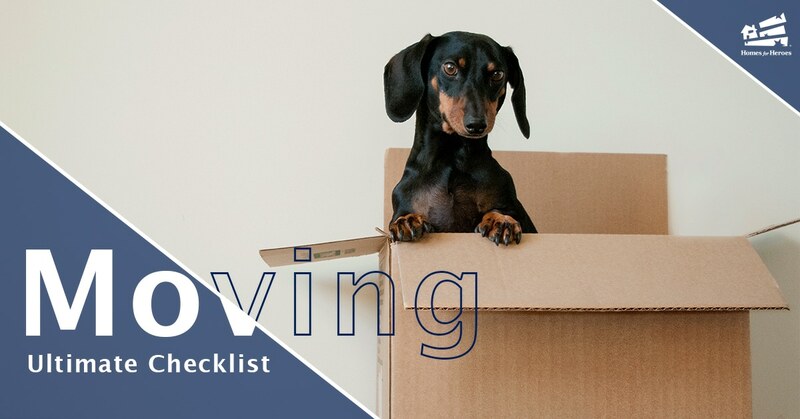 IMPORTANT Ultimate Moving Checklist To-Do: Schedule all disconnects for your current residence AND schedule all new connections for your new residence including gas, electric, water, telephone, cable, internet, phone and garbage. Remove all light bulbs from lamps you’re moving to avoid breakage. Fill your prescriptions and if you’re leaving town, locate a new pharmacy in your new town. Prepare a list of emergency service technicians (plumber, electrician) for the new home – just in case. Determine best route to take to work from new home (car, public transportation). To keep kids safe and out of the way, set up a babysitter or a playdate for day of the move. Find somewhere comfortable, safe and ideally familiar for your pets during the move (babysitter, daycare, friend or family members). Send out moving announcements to friends and family so they are aware of your new address and they can update their contact information. Transfer homeowners or renters insurance to your new home. Cancel or transfer your membership at the fitness club(s). Update the address on your driver’s license. Update your address for any monthly subscriptions you receive. Dust indoor furniture and clean outdoor furniture before its moved. Pack an “essentials box” with everything you’ll need for the first 24 hours in your new house. Don’t forget toilet paper, phone chargers or any personal care items. Empty oil and gas from equipment like your lawn mower, snow blower and barbecue grill to avoid leaks or spills. Clean your home thoroughly from top to bottom. If you’re moving from a large home or have areas that will need a deep clean, you may even want to start cleaning earlier than a week before the move. Remember to fill all nail holes and putty any nicks. Keep some cash on hand to tip movers or pay for any last-minute expenses. Take pictures of your old home so you have documentation that you left it in move-out condition. This is especially important if you’re selling your home and negotiated on certain repairs or upgrades. But you’ll also want to do this if you’re renting to make sure your landlord doesn’t invent damages to try to take more of your security deposit. The night before you move, unplug your refrigerator and freezer to let them defrost. But be sure to put a towel down so you don’t leave a mess. Go through your moving checklist one last time to make sure you’ve done everything on your list. Once you’ve gone through each item, there’s nothing left to do but move into your new home. By using the Homes for Heroes ultimate moving checklist, you can simplify the process, feel confident everything is accounted for and ensure a smooth transition for you and your family. Be sure to check out the Homes for Heroes Local Deals for special moving discounts or deals on moving supplies. If you know a firefighter, EMS, law enforcement, military, healthcare professional or teacher looking to buy, sell or refinance a house, please let them know about Homes for Heroes and the savings they can receive by working with our specialists.